The Gallery Corner is a location in the Game & Watch Gallery series that houses the Note Board, the Music Room, the Museum, the Gift section, Secrets (Game & Watch Gallery 3 only), and Game & Watch History (Game & Watch Gallery 4 only). 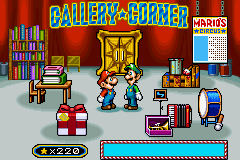 The Gallery Corner first appears in Game & Watch Gallery 2, where the Gallery Corner has four sections: Note Board (initially available), Music Room (five stars required), Museum (ten stars required), and the Gift section (permanently available after collecting 100 stars). With 55 stars, the Music Room can be upgraded. The Gallery Corner reappears in Game & Watch Gallery 3, where the Gallery Corner holds the four sections used in Game & Watch Gallery 2 as well as Secrets 1 (fifteen stars required) and Secrets 2 (sixty stars required). In Secrets 1, a sample of the reversed Fire is shown. In Secrets 2, the reversed Fire becomes playable. The Gallery Corner reappears in Game & Watch Gallery 4, where the Gallery Corner holds once again the four sections used in Game & Watch Gallery 2 as well as Game & Watch History (seventy stars required), a timeline about the original release date of every Game & Watch title released. The illustration used for Game & Watch Gallery 4's Note Board says "Mario's Circus" (possibly because of the amusement park as a background). This page was last edited on February 21, 2019, at 03:40.